Ahh..the best type of office mate...ever! How nice to have such a cute office mate while you work! But... but... he's not staring you in the face and poking you! That's what I do here. Jen says she wishes her helper would help like that. Hers stays in her way. You are very lucky to have such a cute office mate - but the question is, does he help??? 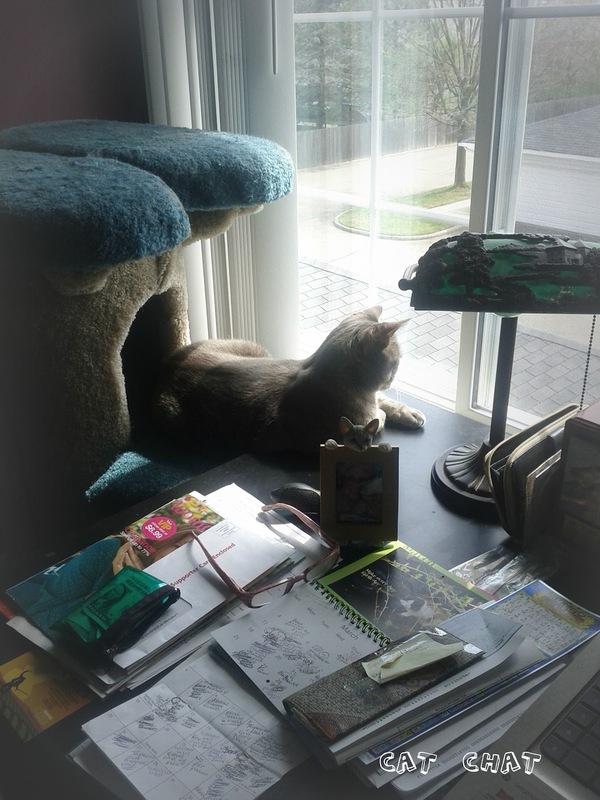 Cody, you've got a nice observation post there on your Mom's desk! It's always nice to have company while you work - or peek out a window! Miss Caren I'm glad you have "company" while you work - I bet Cody makes you smile!! Great photo. I can't imagine an office without a feline office mate. How do people without cats in their office get any work done? Cody you are so helpful!!!! Cody, you make a terrific office mate. Looks like you are doing a good job too. Have a great day. Mum says could she exchange you with Lucy because she keeps walking about on the desk and standing in front of the screen! Can you please teach Eva and tell her not to just sleep in my office? Thanks!!! OMC! Cody has a cat tree right on the desk. Pop, I want one too! What a great team you two make. Nice....but does he bring you your Starbuck's? Thank you for your comment on my blog. We visited Kauai and we loved there very much! Its the furry kind of life You're both so lucky to have each other! Great office and great buddy! You've got a great office! You have your cat tree positioned perfectly Cody, but we thought an office mate should lie across the keyboard so your mum has to try and type around you. That's what we do. @Abby thank you! I love it! @Alley Cats and Angels, so nice to meet you! Thank you for stopping by! He is the best office mate ever! @meowmeowmans, awww thank you! Cody is a great office mate! @Rykers you got that right! @Priscilla I can't do that because usually I am sleeping! MOL! @Marg thank you! I do my best! @Diane I sure do! Cody is a good "snoopervisor!" @rumpydog tell Jen that Cody is often in the way too so don't feel bad! @Old Kitty thank you!!! Please tell charlie hi! @Nellie, don't be jealous!! You get to have all sorts of adventures because you have a yard and all and I don't have that! I loves me a kitty co-worker! aww, Cody you are not paying attention to your work! how fast can you type??? well lets forget about the work, I need to wish you a belated Happy birthday & congrats on your remarkable posts! thats a big number esp for a kitty who pays more attention outside the work place ( can't blame you there may be birdies & critters to see!) Have a happy week!